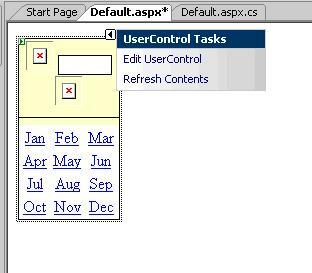 User controls are one of ASP.NET methods to increase reusability of code, implement encapsulation and reduce maintenance. User control is similar to web page. Both web pages and user controls contain HTML elements and markup for web controls. Some tags, like <html>, <head> or <form> cannot be used in web user controls. This web user control could be used when you need to repeat same code on many pages. Good examples are page footer, header or some kind of site navigation (depending of your case, it is good idea to consider using of Master Pages for this task as well). Except static HTML code, web user controls could contain web controls. You can simply drag and drop items from toolbox to user control. Like any other control, user controls can have properties, methods and events which make them very useful. 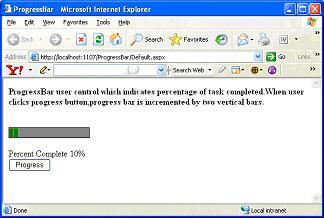 If user control solves more general problem, like progress bar or data pager control then can be useful on many different web sites. On this way, user controls can provide more stable and tested code. New dialog will appear. To create new web user control, select web user control template, like in next image. Choose a name for your control and click Add. TagPrefix: prefix for user control tag. This prefix will be used in markup code later. TagName: tag name of user control tag. Src: path to .ascx file. On this way, you can choose when and which control to load, based on user preferences, user or role rights etc. In detail guide how to load user controls dynamically you can read on Working with Web User Controls at Run-time tutorial. Except predefined events, it is possible to declare your own events so your user control can notify the rest of application when something happen. Every event procedure use two parameters. First parameter is sender, the control that sent an event, and the second parameter is EventArgs object, or the custom class that inherits from System.EventArgs class. If we use custom class, we can add additional information that can be used in event procedure. But, in case that we have simple event, we can use generic EventArgs class. Ok, enough about theory, we created two pretty useful examples of user controls. Maybe you can find them useful in some of your web projects. First example is A simple Month Calendar Control which could be used for month selection when using of classic calendar control is inappropriate. Second example explains How to create ProgressBar user control when visitor expects to know a progress or current state of some operation. User controls could be very useful to save your time and avoid confusion. ASP.NET provides other types of controls, including custom server controls, components and web parts. Also there are a number of third party controls from independent software vendors. These controls are already well tested on many web sites and for small price can save you a lot of work. Third party controls are rarely created as user controls. Usually, they are compiled as custom server controls. Although user controls are easier to create, custom controls are easier to use. They can be placed on Visual Studio toolbox and act as standard built-in controls.